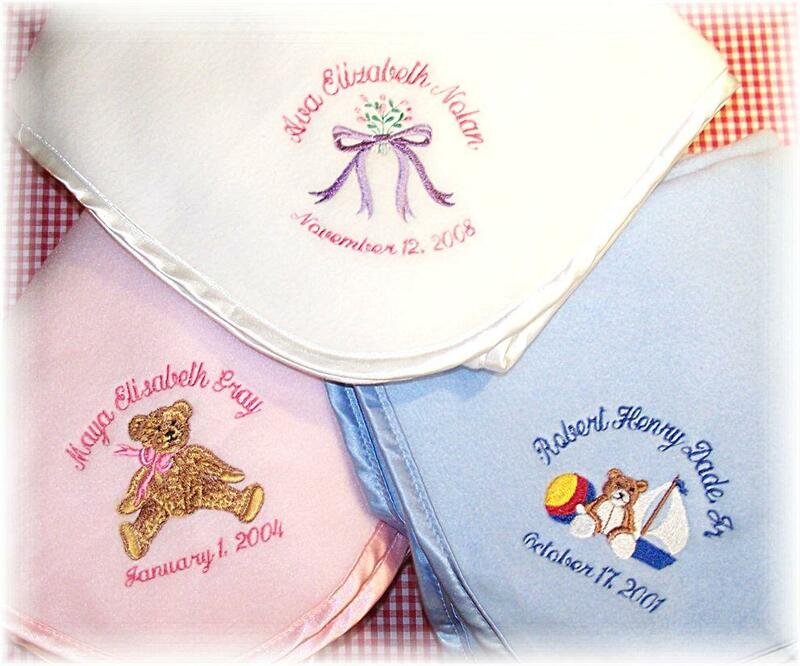 Personalized Fleece Baby Blankets. Destined to become baby's favorite comfort object. This cozy satin-bound fleece personalized baby blanket is top quality! They wash like iron and will withstand years of loving. Ultra-soft and light weight it measures 36" by 48". Blanket personalized with baby's full name over the embroidered design with the date of birth below the design. Blanket Color: Light Pink, Light Blue and White. Hello Alison-I just wanted to say "thank you" for another wonderful baby gift!! You are always the first one I think of whenever a friend or family member has a baby. We received one of your blankets as a gift more than 8 years ago for our son. Tattered and torn from all the loving, It is still very much a treasured item. Thank you again for your beautiful blankets. I have been giving this gift for a over 10 years and I hear over and over how much the gift is appreciated, used and loved (after all these years). We have been ordering these baby blankets for our clients who have new babies for over 10 years. Everybody just loves them and we hear about how much the gift is appreciated over and over. Babyobaby makes it so easy to look so good! My daughter absolutely adores this blanket! She is almost 6 years old and still sleeps with it every night. Thank you for making such a wonderful and long lasting keepsake. We will never ever let this one go. Thank you for such a wonderful blanket! My daughter received one as a gift when she was born. Over six years later and she is still loving it each and every time she goes to sleep. I've wanted to thank you thousands of times and am finally getting around to it. P.S. I just ordered one for our brand new nephew. I know it will be a hit and I am so happy to "share" this truly wonderful gift! We have been giving this blanket as a corporate baby gift for at least the last 8 years. It is so easy to order and WOW how they are appreciated. I get a kick out of seeing the reaction when we present them. Thank you Alison for such a wonderful gift! We love this blanket. Our company has been giving this to our employees for years. They are always appreciated. We often see the blankets years later, still in use and obviously loved. Thanks for making it all happen. Thank you for following my "Special Instructions" the colors are perfect and I know my brother is going to go ape****! I'm sure my nephew will come to love the blanket just as much. It looks great! Allison, The blanket was even more beautiful in person. We presented it to our Pastor and his wife on Sunday and they were very very touched. Thank you for making this blanket so special. It has been a long time since I needed a baby gift. I knew I wanted to order this blanket...But, WOW have things changed. The new site, new stuff, new designs it all looks great! Glad to see you are still doing well. AND can't wait to get the blanket! What a wonderful gift! We got one when our daughter was born. We loved the gift and found out very quickly how attached she would become to this blanket. I am ordering one now for my newest nephew with great confidence that they will also end up loving it more than words can express. Love IT! It is just perfect!! Thank you Alison for sharing your talent with the World! Alison, Hope you have the best year ever! Happy 2010...you deserve it! I received your blankets as gifts for my two youngest children and love them. They were given to us by my husbands employer. They will be lifelong keepsakes. And they have been my gift of choice for any employee who works for us at Freight Capital! I hope you know just how much your work is appreciated. My wife and I have been giving these blankets, to all the new babies in our lives, for years. We always hear how much the blankets mean to parents and we can see how much the blankets have been loved by the children years later. Thanks Alison - Sounds good to me! I must tell you I received one of your blankets 8 years ago for my son Josh (and then one for my daugher Sophie). We still have them - they are one of the only baby things I have saved and I still order one for every friend of mine who has a baby. I LOVE them! We got one of these blankets from my employer when my son was born. He can't sleep without it! We now give this to every new baby in our lives. It is so nice to give a gift that you know people will always appreciate. I've been meaning to write a review for these blankets for awhile. These make the BEST baby gift! I have given them for over 8 years and always get such a remarkable response from the lucky new parents. Thank you for making giving a great baby gift simple. As you know, I have now brought the "blanket" tradition to four companies and everytime I introduce it, it's a huge hit. We just started it here at GPD and I have gotten calls from every one of the employees thanking us for such a special, useful, and wonderful keepsake. Your quality is top notch and I love the response I get! Thanks again!